Claremont, Calif. (September 21, 2017)—Pitzer College and investment firm BlackRock, Inc. announce the first ever global equity index fund that is both Environmental, Social and Governance (ESG)-focused and fossil fuel-free. The fund is designed to help endowments, foundations and other nonprofit organizations meet their Responsible Investment goals. This August, Pitzer College became the founding investor in the MSCI ACWI ex-Fossil Fuels ESG Focus Index Fund B. This new fund uses a disciplined, quantitative approach to incorporate ESG factors in its portfolio construction while maintaining zero exposure to fossil fuel companies. The fund was developed with assistance from leading index provider MSCI and investment consulting firm Mercer. “We are pleased that Pitzer College and BlackRock have chosen this global benchmark as they expand their ESG investing initiatives,” said Jana Haines, managing director and head of Americas Index at MSCI. Pitzer College, home to the Robert Redford Conservancy for Southern California Sustainability, is a nationally recognized leader in environmental sustainability practices and academic curriculum. In 2014, Pitzer launched the Fossil Fuel Divestment-Climate Action Model, making Pitzer the first private college or university in California to divest from fossil fuels. Pitzer also reduced its carbon footprint by 25 percent in two years; established a campus task force to bolster on-campus measures to promote sustainability; and developed an ESG policy to guide endowment investment decisions. One of the first colleges in the US to launch an environmental studies program, Pitzer has promoted environmental awareness for nearly 50 years. 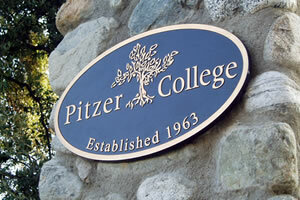 Environmental Sustainability and Social Responsibility are Pitzer College core values. Nearly fifty percent of college buildings are LEED-certified. Drought-tolerant landscaping has helped Pitzer cut its water use in half since 2002. Pitzer was awarded a STARS Gold rating from the Advancement of Sustainability in Higher Education in 2016. The College researches, teaches and lives its commitment to sustainability. For more than 40 years, MSCI’s research-based indexes and analytics have helped the world’s leading investors build and manage better portfolios. MSCI is a leading provider of ESG indexes. Clients rely on MSCI’s offerings for deeper insights into the drivers of performance and risk in their portfolios, broad asset class coverage and innovative research. The company’s line of products and services includes indexes, analytical models, data, real estate benchmarks and ESG research. MSCI serves 97 of the top 100 largest money managers, according to the most recent P&I ranking. For more information, visit www.msci.com. Mercer delivers advice and technology-driven solutions that help organizations meet the health, wealth and career needs of a changing workforce. Mercer’s more than 22,000 employees are based in 43 countries and the firm operates in over 130 countries. Mercer is a wholly owned subsidiary of Marsh & McLennan Companies (NYSE: MMC), the leading global professional services firm in the areas of risk, strategy and people. With more than 60,000 colleagues and annual revenue over $13 billion, Marsh & McLennan helps clients navigate an increasingly dynamic and complex environment. For more information, visit www.mercer.com.